The boardroom: one of the most important rooms in the office. It’s where decisions are made, influence happens and where an impactful first impression with future clients or employees could make all the difference to your business. These are substantial wooden surfaces that will make an impact. If you are considering investing in a conference or boardroom table, and are ready to commit to a minimum of £10,000, please use our contact form to arrange an appointment. Earthy Timber has the expertise, experience and skills to design and create the perfect bespoke wooden conference table for the room where executive meetings and presentations take place, or where you need to impress. This is art that’s truly operational; long-lasting, powerful and a key part of your business. Entirely bespoke and finished to absolute perfection, these are unique, luxury table surfaces for the discerning corporate customer who knows and understands understated style. A centre piece with true impact. We source substantial, large-scale slabs of timber, kiln-dry and treat them with a variety of specialist finishes to turn them into tables that take pride of place in your boardroom or conference room. With its random, asymmetric patterns, wood is one of the most beautiful materials in the world. Precious and highly desirable, Earthy Timber captures nature at its best, frozen in time as if it were the most beautiful photograph you have ever seen. Our pieces are perfect centre pieces in an elegant yet forward-thinking working environment: substantial, large-scale slabs of English and European wood are kiln-dried, treated and finished to the highest quality standards. A modern, functional work of art for your boardroom or conference room. Multiple planks can be joined together with natural or coloured resin – a stunning, contemporary look. For impact and sustainable beauty, we can preserve the wood’s natural or “live” edges – dramatic, dazzling and one hundred percent guaranteed to attract the sort of attention that the piece deserves. Furthermore, we design our table legs and plates for a seamless, sleek result. We work closely with metal experts and skilled chemical engineers to complement your unique wooden surface. We can take care of everything. Unique within our field, we have a vacuum kiln-drying chamber on-site in our wood yard in Plumpton Green in Sussex. After air drying, our vacuum kiln drying process extracts the moisture content of your chosen piece (or pieces) to under 10%. This deeper, more intense technique results in timber that is completely stable and strong for years into the future and into the next generation. Please use our contact form to send us the details of your project. We are looking forward to hearing from you. 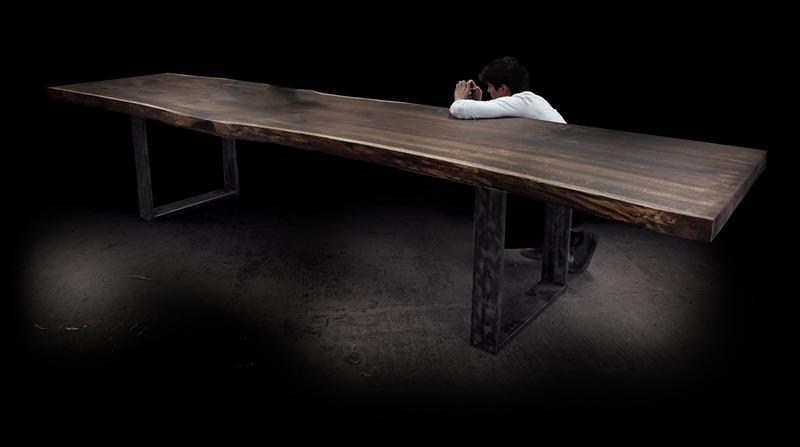 Your bespoke wooden conference table awaits you. Make it the best with Earthy Timber.